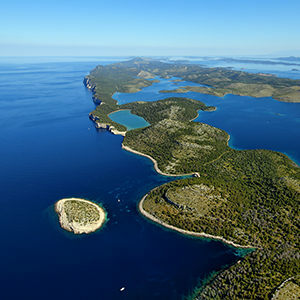 We recommend that on the first day, you set off for the island of Ravni Žakan in the Kornati arhipelago, as it is only 12 nautical miles from Murter. Even if you set off in the late afternoon, you will arrive at this beautiful island just in time to enjoy the sunset. In addition to a safe berth, here you can “feast” on seafood and meat specialities in the pleasant Žakan konoba (tavern), prepared in the traditional way. The reception desk of the Kornati National Park is also found in the harbour, and here you can obtain all the information you need for your stay in Kornati National Park. Assuming that on the first day you were unable to resist the Dalmatian meals and wines served in the Žakan konoba, for day 2 we recommend the short sail to visit the must see Telašćica Nature Park. Telašćica Bay is the southernmost bay on the island of Dugi otok and is a perfect place to take a swim, visit Mir Bay and take a walk to the seawater lake of the same name. Sail out of Telašćice through the Mala Proversa passage towards Kornati National Park, as our next destination is the island of Žut. If you should experience a light maestral or bura wind on this route, this will be an excellent opportunity for sailing. 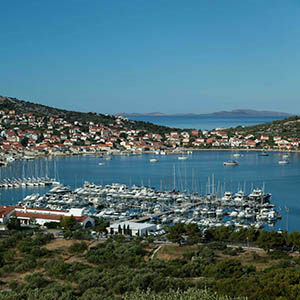 We recommend you take a berth in the ACI Marina on the island of Žut. On this day, we recommend a visit to Skradin, a small picturesque town situated at the place where the Krka River touches the sea. This small town has a long history (it is more than 6000 years old), and lies at the very entrance to the Krka National Park. 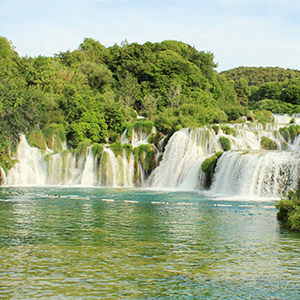 We recommend you visit the monastery on the island in Visovac Lake, and the magnificent Krka River waterfalls. At dinner, enjoy the sounds of klapa (a capella) singing, characteristic for this area. Set off back for the islands, this time the route takes us towards Kaprija. 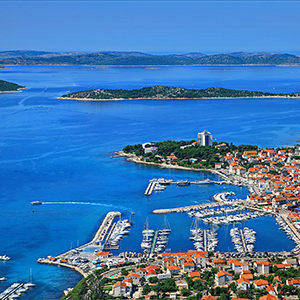 This is a small island in the Šibenik archipelago. The island was named after the caper plant, which is a commonly used seasoning in Mediterranean cuisine. 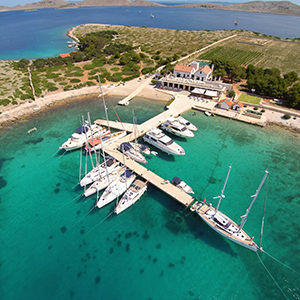 The Kaprija harbour, on the northwest side of the island, is naturally protected from all winds, and ensures a safe berth for the many boaters looking to relax and savour the homemade specialities. 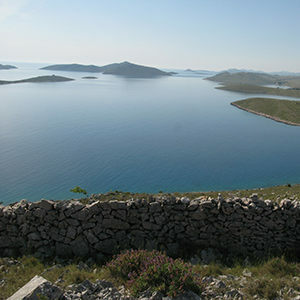 From Kaprija, we return back towards the Kornati islands, to the island of Ravni Žakan. At the end of this beautiful cruise, be sure to again stop in to enjoy the magnificent Kornati cuisine in the Žakan konoba and enjoy the service of the kind staff. Considering that the boat must be returned in the morning hours, we recommend you set sail for the Hramina Marina early.